"This Winter's Night" evokes the vibrant, Earth-centered roots of the winter holidays. 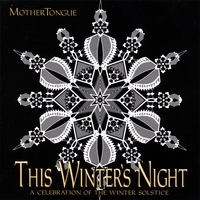 On this CD, MotherTongue combines a 20-voice chorus, Celtic harp, African drums, Renaissance instruments and keyboards to create a unique blend of eclectic seasonal music, both ancient and modern. My favourite yule present to myself (my secret stash) and I am still listening to it today, even after the yule tree is down and sugarplums all eaten. I may not pout it away, it will be meaningful even at Beltane. Thank You. It's hard to find a good pagan-oriented album for the Winter Solstice, and this one is much more fully committed to an alternative spiritual approach to this season than any others I've found. I had it on cassette for years, but all my cassette players went defunct. I was happy to be able to replace it on CD. The arrangements and harmonies are all very melodic, on-key, and enjoyable. The "weakest link" is the story of "The First Song," but only because it is a spoken story, not a song, and for me personally, if I want to listen to an album over & over, I get bored with spoken stories much faster than with a good song or instrumental. (The one reason I can't give it 5 stars.) That said, it is a sweet Yuletide story, and you don't find many of those around either. Overall, the album always gives me the feeling that I am present at a really well-constructed midwinter sabbat. It's truly a gift to those of us who don't relate well to goings-on between angels and shepherds and kings and snowmen and reindeer. This music is so thoroughly refreshing, and so very appropriate for the winter solstice in our cold Canadian prairie winters. This CD fits beautifully into the play lists that we use for the holiday entertaining around the winter solstice, for our friends of all persuasions and associations. At a season when we are over-saturated with christmas music, it is very refreshing to have music that celebrates the Yule season and winter. This CD is a gem, and I look forward to reading The First Song to my grandchildren. This is my absolute favorite holiday cd. I first had the tape about ten years ago. I played it until it crumbled in my hands. This year I was elated to find I could order this cd on cd baby for my solstice celebration. THANK YOU THANK YOU THANK YOU. It gives me such joy to share this work of art with my family.